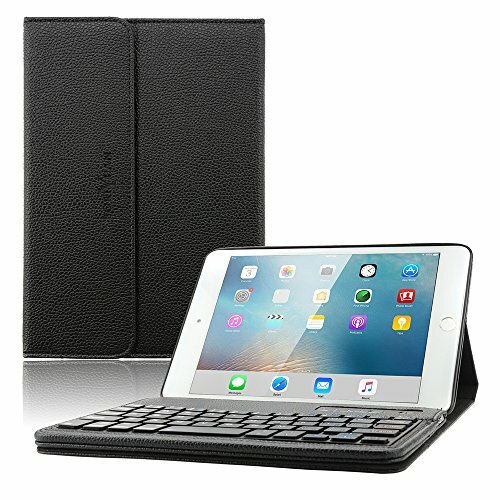 Boriyuan iPad Mini 4 Keyboard Smart Case Stand Folio Leather Cover with Detachable Wireless Bluetooth Keyboard and Screen Protector +Stylus for Apple iPad Mini 4 (Black).You can check the model number on the back of your ipad! NOT for: iPad Air/ iPad Air 2/ iPad Pro 12.9 inch/ iPad Pro 9.7/ iPad 9.7 inch/ iPad 4/ iPad 3/ iPad 2/ iPad/ iPad Mini 1 2 3 or any other tablets!!! Special keys for brightness, home, screen lock, volume and playback controls,easy to use. Comfortable, high quality and natural ABS keys provide a quick response and silent typing experience. Easily setup your iPad at the first time; afterwards pairing is automatic once the keyboard is turned on. The keyboard case which with versatile adjustable stand will offer you a comfortable viewing angle when working or watching movies. Bluetooth keyboard can used with other Bluetooth-enabled devices.And it is detachable, you can remove the magnetic keyboard when not in use. With the Auto Sleep/Wake Function ,When open the smart cover, your iPad instantly wakes up; when close it, your iPad automatically goes to sleep. You can press any key to wake the keyboard up. Boriyuan offers a 1-YEAR hassle-free warranty to ensure long-lasting coverage, power and protection!" Apple iPad Mini 4 Leather Protective Case - Made of high quality PU leather cover and soft, microfiber-lined interior,it provides full protection for your tablet against dusts, scratches and bumps. *** NOTE: Exclusively designed for iPad Mini 4 (Model:A1538/A1550 ), NOT fit for any other tablet. Multiple Angle & Precise Cutouts - This iPad mini 4 case with keyboard can fold into different stand view angles which can offer you comfortable typing position and media viewing.It also allows the viewer to use hands-free whatever it is being used for viewing.Moreover, the precise cutouts allows easy access to all ports. Detachable Multifunctional Mini 4 Keyboard Case - The lightweight bluetooth keyboard is removable and ultra slim.With ABS chiclet keys,it will offer you smooth and comfortable typing experience. The keyboard also includes an on/off switch to ensure you preserve battery power when not in use. Reliable Wireless Connectivity Keyboard -The bluetooth signal on the keyboard has a range up to 30 feet.It also has 120+ hrs. of working time, 800+ hrs of standby time and only takes 1-2 hours to fully charge. The removable wireless keyboard also can be paired with Android smartphones, iPads or other bluetooth-enabled devices. Package & 100% Satisfaction Service - It includes: 1x iPad keyboard case for mini 4 , 1x removable magnetic Bluetooth 3.0 ABS keyboard,1x micro USB charging cable, 1x user manual. ★★★Boriyuan provides you with 24-hour email contact service & 1-year worry-free warranty &30-day money-back guarantee.